Clark Stationery - Embossed Graphics - For more notepad choices click Embossed Graphics to go to our sister site to order. 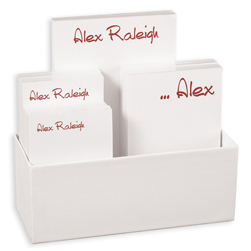 Item Name: For more notepad choices click Embossed Graphics to go to our sister site to order. Description: For more notepad and stationery choices click Embossed Graphics to go to our sister site to order. These seven tablets of varied sizes fit easily into drawers, pockets and purses. Or keep them all organized in the exquisite hard shell paper wrapped holder included with your order. Size: Assorted, smallest 3.2 X 5 inches, largest 5 X 8. Paper White. Ink colors: Red, Navy, Emerald, Black, Fuschia, Tropic, Mocha and Purple. Pricing: For more notepad and stationery choices and pricing click Embossed Graphics to go to our sister site to order.